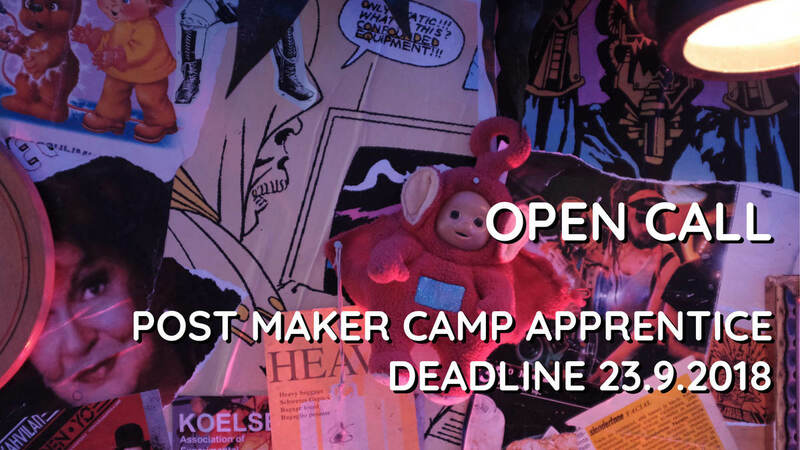 Association of Experimental Electronics (Helsinki, FI), Pixelache (Helsinki, FI) and Cirkulacija 2 (Ljubljana, SI) are looking for two apprentices to join the Post Maker Camp, which will be held in Vihti, from the 13th to 21st of October 2018. The Post Maker Camp consists of a practical part of producing a waterborne sound installation, performing with the said installation and theoretical discussions on the current state of media art and building weird things from electronics, especially in relation to the today's trend of "maker culture". The two apprentices will take part in the camp on an equal basis to the established members of the collectives. The reason for seeking apprentices is to import fresh viewpoints and fresh ideas and the hope that by observing the work of established practitioners will be useful for the younger generation of artists. Accommodation, food and reasonable travel costs (150eur per apprentice) are covered for the period of the camp. Accommodation is provided in shared rooms. Unfortunately, there is no honorarium for apprentices. Apart from minor exceptions, apprentices should be prepared to participate in the camp for the whole period. Working language is English. The camp is a continuation of a similar camp held in May 2018 in Ljubljana, Slovenia. Applicants should send an application before the 23.9.2018 to oturpe@iki.fi. The format is free, but the letter should preferably contain a short bio and some kind of motivation of participation. The only requirements are the interest in working with technology and art and willingness to discuss makerism from a critical angle.